Print Code 39 from inside any Windows program. Bar code 39 is the simplest and most popular bar code there is. It is so easy to use that you can just type in it. It features upper case letters, numbers, and some symbols. Print Code 39 on ID cards, shipping labels, documents, and stock cards. Or you can print whole sheets of Avery™ labels using our templates and your word processor. Finally, you can export your barcode as an image file in gif, jpg, bmp, or png formats. 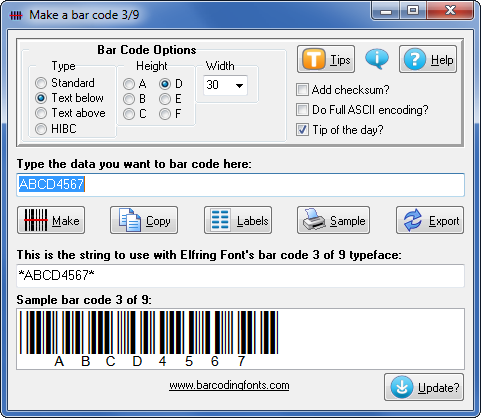 This barcode package lets you create HIBC (Health Industry Bar Codes), standard (barcodes only), and the human readable (bar codes with text or numbers either above or below the barcode). Check the bar code 39 samples page to see examples of each type of bar code you can create. Generating Code 39. The quickest (and easiest) way to print Code 39 or HIBC is to use our software. Type in your data and click the Make button to build a barcode. You can print unlimited numbers of barcodes, on labels, in your packaging, or even export the bar code as an image file and send it to someone else to print. Printing Sheets of Labels. Run our software, type in your data, and generate a barcode with just a click. Use the Labels button to select the size of the Avery™ label you want to print your bar code on. Our templates cover all standard label sizes. Your label template will appear in your Word processor, where you can add text and even graphics to your barcode label. Saving Barcodes as Images. If you want to send your bar code to someone else, our software will export your barcode 39 as an image file in bmp, gif, jpg, or png formats. You have a choice of 300, 600, 900, and 1200 dpi resolutions. Generating Multiple Bar Codes. Generating large numbers of different Code 39 or HIBC barcodes is easy. This package includes Visual Basic macros that run inside Access, Excel, and Word to create your barcodes. Just add our macros to your Excel spreadsheet and you will have new formulas that build code 39 barcodes directly from the your data inside that spread sheet. Use these Code 39 fonts in: Word, Excel, Access, PageMaker, Illustrator, Quark Express, Corel Draw, FoxPro, and many more. Embedding in PDFs: The retail version of these fonts will not embed in a pdf file. Embeddable fonts for pdf files require a special license.